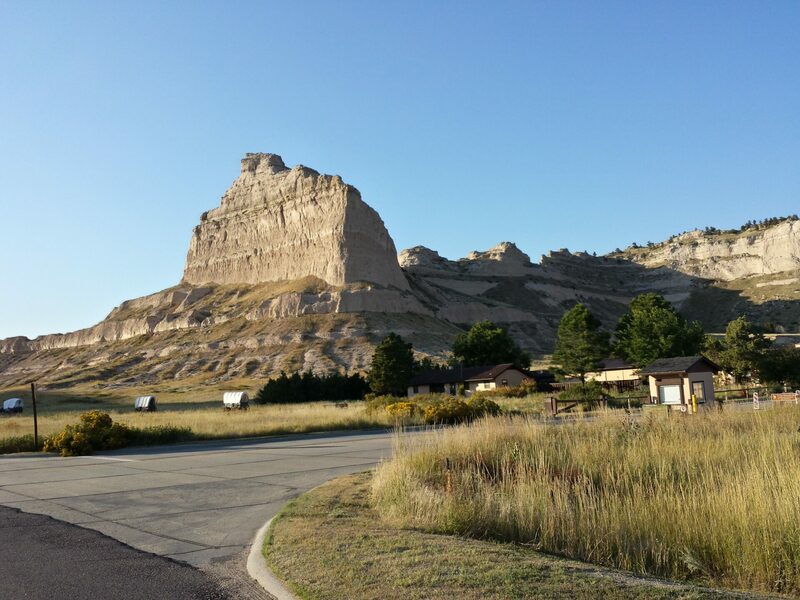 After Mount Rushmore, we made a long push out of Custer State Park and into Scottsbluff, Nebraska through the Oglala Grasslands. Nebraska is one of the most boring states I have ever seen. Flat, rolling farmlands. That’s it. No signs. No side roads. No towns. Just emptiness, dotted with an occasional farmhouse, grain silo, or fence to keep the cattle in. I was bound and determined to make the best time possible through this very boring stretch of land, but unfortunately got stuck behind a gang o 10 bikers and their mini-van ride-along caboose. They refused to go above the speed limit (55 mph) and were clearly on an afternoon joyride. There was no way to pass them since their caravan stretched for a very long distance. Of course they had no thought to pull over and let me go by. This went on for 2 tedious hours. Elana and I had a discussion about trying to overtake them at high-speed along a stretch of straightaway, but we decided against it for fear of engaging the notorious biker wrath. We thought the Oglala Grasslands were going to be interesting but it was just more of the same. There was occasionally a sign for “National Park” but all we could see looking down those dusty side-roads were miles and miles of dirt roads that seemed to lead nowhere. We didn’t take any of them. Finally, in Crawford, Nebraska, the bikers took a break and we got to go ahead of them. Elana wanted to stop in Crawford, and actually so did I – it would have bee nice to take a break and try to see if we could recreate another Chugwater. But, I wasn’t going to let this opportunity to pass the bikers slip away, so I decided to press on. The next real opportunity we had to stop was a town called Scottsbluff about an hour South of Crawford. 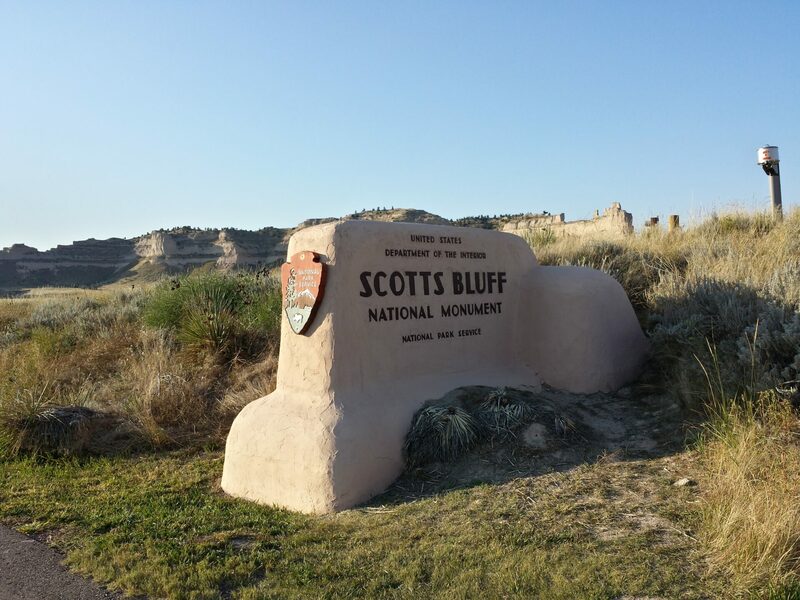 The key feature of Scottsbluff was a bluff on the edge of town that you climb. We grabbed linner around 4PM in the nearby suburb of Gering (which was cute by the way), population 8,500 people. 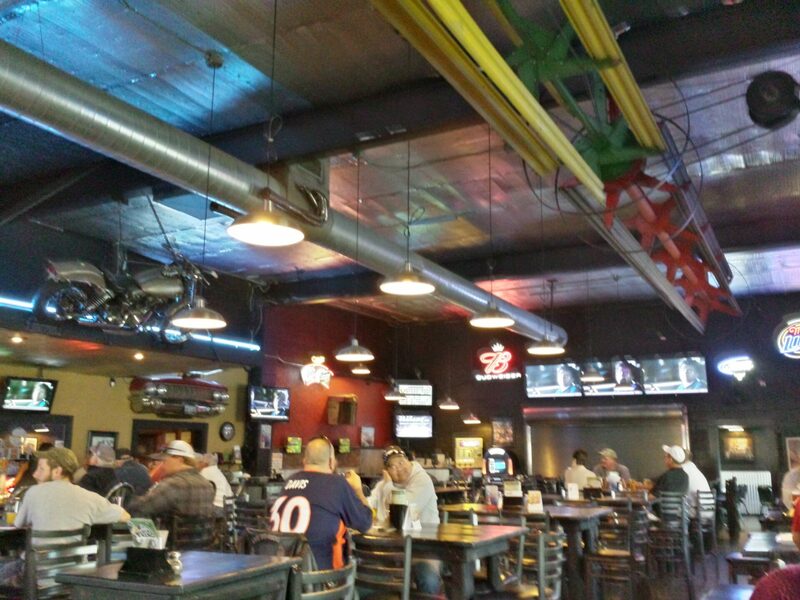 The place we chose was the Steel Grill (rated #5 on TripAdvisor), which was a Nebraska Version of a BJs or Yardhouse. It was much nicer than we expected and I even ventured out on a limb and got a salad. Elana ordered fish. Both were excellent and much needed after 4 days of eating crap. Plenty of University of Nebraska fans (go Huskers!). After linner we stopped by a nearby gas station to ask for directions to the Scottsbluff State Park to go for a hike and stretch our legs. The directions were pretty much “See that bluff in the distance? Drive to it.” It wasn’t overly complicated. At the entrance to the park there was a substantial recreation facility complete with museum (which was closed for the day), outdoor amphitheater, restrooms, and history walk where you could see covered wagons and learn more about the Oregon Trail, which apparently also passed through Scottsbluff. We ended taking the last remaining 2 hours of daylight to climb up to the top of the Scottsbluff bluff and then come back down. 4 hours later of more boring plains, dusk, deer anxiety, and darkness (Eastern Colorado is nothing to visit either), we reached Denver, exhausted but satisfied.